Come visit us on the third floor of the College Activities Building! You can also call us at (360) 867-6220 or contact individual staff members at their email below. As the director, Jeannette is responsible for the provision of a range of student-fee funded programs. These include Student Activities administration including supporting registered student organizations and advising the Geoduck Student Union, The Cooper Point Journal and other student publications, and the Tacoma and Native Pathways Student Activities Committees; as well as supporting KAOS, The Flaming Eggplant Cafe, Student Art Gallery, and the Bike Shop. Jeannette has a Bachelor of Arts in Journalism, a Master of Arts in Educational Leadership, and a Ph.D. in Educational Leadership from the University of Nevada, Reno. She brings over 10 years of student affairs experience in student unions, financial aid, residence life, advising, student activities, budgeting, facilities, commuter student services, grant management, and curating an art gallery. She likes to spend traveling, cooking, and reading books with her family. Emily Pieper is a graduate of Evergreen herself and as a student spent much of her time working with various student groups on campus as well as supporting other on and off campus community organizations. Prior to working at Evergreen, Emily worked as the Program Director for a local grassroots nonprofit, Stonewall Youth. She is particularly interested in supporting students to find connections between the work they are doing in Student Activities to make the campus thrive and how it can affect and support the larger community outside of Evergreen. She is very excited to be working with such a variety of creative and inspired students! Melissa Bennett (Umatilla/Nez Perce/Sak & Fox) is the newest Student Organizations Advisor for Student Activities. Previously, she worked as the Senior Program Coordinator of the Native American Student and Community Center at Portland State University and as an adjunct professor at Marylhurst University. Melissa is an alumni of The Evergreen State College and in 2012 earned a Master of Divinity degree, a graduate certificate in Pastoral Care and Counseling, and a graduate certificate in Theological Studies from Marylhurst University. Following graduation, she served as an interfaith mental health chaplain specializing in the spiritual care of indigenous people. Melissa is a writer and emerging storyteller and has twice been nominated for the Pushcart Prize in poetry. She is interested in story as medicine, especially its ability to heal historical trauma among indigenous communities. Kayla is an Evergreen graduate and enjoys contributing to the autonomy and respect that students receive from the staff. She loves the Pacific Northwest with her whole heart including all of the PNW clichés: excellent coffee, wool clothing, ferry boats, rivers & ocean, trees, all of it. She managed two small farmers markets in the South Sound prior to her work at Evergreen. Greg is Productions Advisor in Student Activities Administration and Coordinator of S&A Productions. He has worked in these capacities at Evergreen since 1997. As Productions Advisor he advises student groups and sits on various event committees throughout the campus. 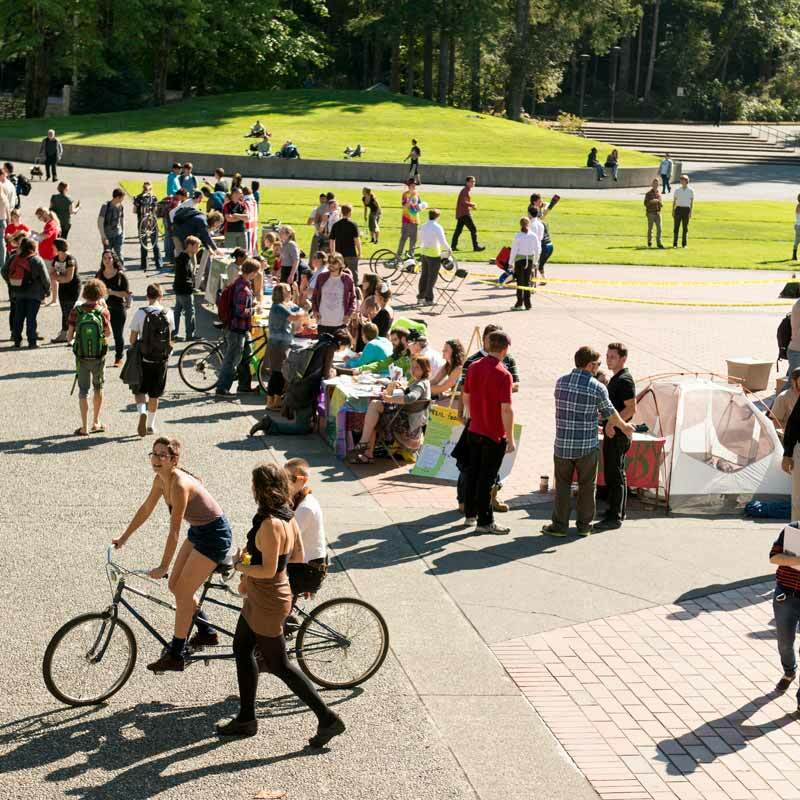 As Coordinator of S&A Productions he organizes large stage events for the Evergreen campus. He hires approximately 14 students as Productions Assistants each year who learn about and gain practical experience in event productions. Prior to coming to Evergreen, he worked in public school education for 9 years providing music education to more than 50 school districts. Jodi graduated from Western Illinois University in May 2013, earning a Masters of Science in College Student Personnel. Born in Washington and raised in Oregon, Jodi is happy to be back in the Pacific Northwest, and excited to start her student affairs career at Evergreen! She looks forward to learning just as much (if not more) from the students she advises as they learn from her. Andrea Vanden Bossche has a Master of Fine Arts in Creative Writing from Eastern Washington University. In addition to advising the Cooper Point Journal staff on matters of writing, media law, and editing, Andrea also advises other student created publications, from blogs to zines to experimental online video game literature. For the past five years, Andrea has been a freelance journalist specializing in writing about video games, anime, pop culture, and art in general, particularly those that are queer focused and independently developed, and continues to do so whenever there is free time (and would really love it if anyone wanted to create a group about queer and indie games). Lindsay is Student Activities Graduate Intern. A recent graduate of the Evergreen Tacoma Program, she is continuing her journey at Evergreen in the Master in Teaching Program. She was born and raised in Southern California, but is happily settling into the great Pacific Northwest. Anthony was born and raised in Texas; and in 2012, he received a Masters degree in Community Counseling from the University of Texas at El Paso. Throughout his work career, he has worked with non-profits and community organizations - most recently with the South Sound YMCA. Anthony is excited to be a part of the Evergreen community and discover all the gems of the Pacific Northwest.